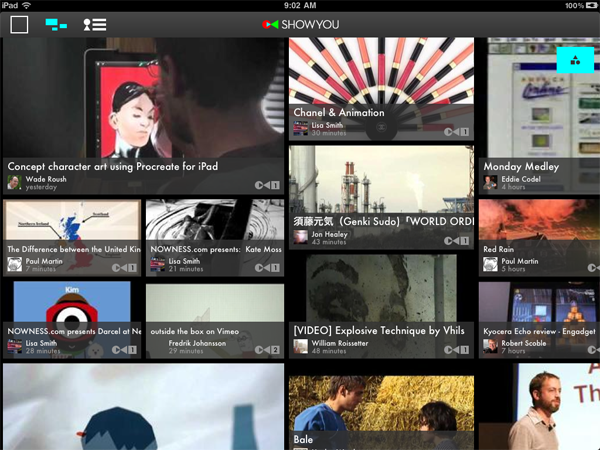 The ShowYou video app puts metadata (or the lack thereof) in the spotlight. Screenshot from the ShowYou iPad app. What the heck am I supposed to click on? Where are the entry points? Some of the images are intriguing, but the vague titles don’t answer the single most important question: Why should I spend time and energy on this? This is partially an interface issue, but I place most of the blame on content creators. Many of us have bad metadata habits. I don’t get any real joy out of writing headlines, subheads, and excerpts. Tagging, while easy, is still a mind-numbing chore. But I force myself to do these things because I want the content I manage to be seen. That’s the point, after all. Metadata helps with that. The area where metadata is most important, however, is video. That content is locked within formats that are generally inaccessible to search spiders and aggregation bots. There’s no way to know about the insightful perspective captured at a clip’s 2-minute mark or the funny pratfall 45 seconds in. Left unaddressed, most video clips have the discovery prowess of a “DSC0000.jpg” file. That’s why a random video still and a vague title won’t cut it. We need metadata to extract the value and explain why a clip is worth viewing. Like everyone else, I wish metadata was easier to create. But it’s not, and it’s not going to be for a long time. You cannot auto generate a useful title and you can’t pluck the first 200 characters from a blog post and expect an appropriate excerpt to magically appear — well, you can do those things, but you shouldn’t. And as aggregation apps like ShowYou and Flipboard and others clearly illustrate, content that’s separated from its container depends on metadata to amplify its signal. This stuff matters. Metadata is now both a competitive advantage and a competitive necessity. And if we really want content to be found and audiences to be served and apps and revenue to be created, we’ll give metadata — annoying as it may be — the attention it deserves.